Don't like the letters assigned to your drives in Windows? Change them! While they might seem set in stone, the letters assigned to your hard drives, optical drives, and USB based drives in Windows are very much not a fixed thing. Maybe you installed a new external hard drive and now you want to change the drive letter to G from the F it was assigned, or maybe you just like to keep your flash drives organized at the end of the alphabet. 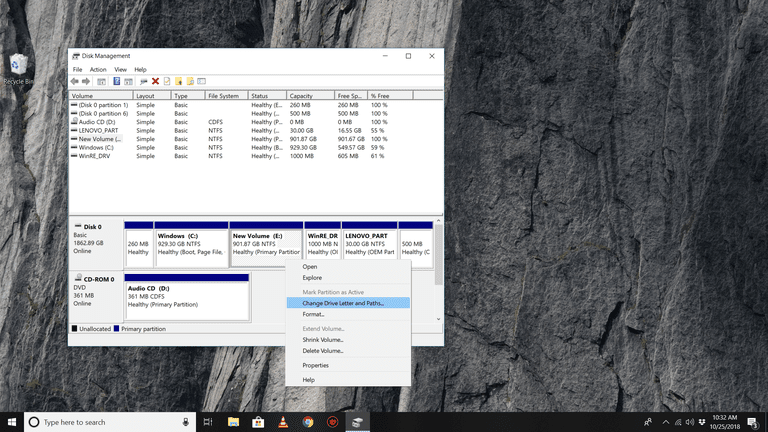 Whatever the reason, the Disk Management tool in Windows makes changing drive letters surprisingly easy, even if you've never worked with your drives in any way before. Unfortunately, you can not change the drive letter of the partition that Windows is installed onto. On most computers, this is usually the C drive. Time Required: Changing drive letters in Windows usually takes less than a few minutes, at most. Open Disk Management, the tool in Windows that lets you manage drive letters, among [many] other things. In Windows 10 and Windows 8, Disk Management is also available from the Power User Menu (WIN+X keyboard shortcut) and is probably the quickest way to open it. You can also start Disk Management from the Command Prompt in any version of Windows, but starting it via Computer Management is probably best for most of you. See What Version of Windows Do I Have? if you're not sure which you're running. Locate from the list at the top, or from the map at the bottom, the drive you want to change the drive letter of. If you're not sure that the drive you're looking at is really the one you want to change the drive letter for, you can right-click or tap-and-hold the drive and then choose Explore. If you need to, look through the folders to see if that's the right drive. Right-click or tap-and-hold the drive and choose Change Drive Letter and Paths. If you've selected the primary drive by accident, some versions of Windows will display a message that reads Windows cannot modify the drive letter of your system volume or boot volume. Choose the drive letter you want Windows to assign to this storage device by selecting it from the Assign the following drive letter: drop-down box. You don't need to worry if the drive letter is already being used by another drive because Windows hides any letters you can't use. Choose Yes to the Some programs that rely on drive letters might not run correctly. Do you want to continue? question. If you have software installed to this drive, it might stop working properly after changing the drive letter. See details on this in the More on Changing a Drive's Letter in Windows section below. Once the drive letter change is complete, which usually only takes a second or two, you're welcome to close any open Disk Management or other windows. The drive letter is different from the volume label. You can change the volume label using similar steps. Changing drive letter assignments for drives that have software installed to them may cause the software to stop working. This isn't quite as common with newer programs and apps but if you have an old program, especially if you're still using Windows XP or Windows Vista, this is likely to be a problem. Fortunately, most of us don't have software installed to drives other than the primary drive (typically the C drive), but if you do, consider this your warning that you might need to reinstall the software after changing the drive letter. You cannot change the drive letter of the drive that the Windows operating system is installed on. If you'd like Windows to exist on a drive other than C, or whatever it happens to be now, you can make that happen but you'll have to complete a clean install of Windows to do it. Unless you have a pressing need to have Windows exist on a different drive letter, we don't recommend going through all that trouble. There is no built-in way to switch drive letters between two drives in Windows. Instead, use a drive letter that you don't plan on using as a temporary "holding" letter during the drive letter change process. For example, let's say you'd like to swap Drive A for Drive B. Start by changing Drive A's letter to one that you don't plan on using (like X), then Drive B's letter to Drive A's original one, and finally Drive A's letter to Drive B's original one.